Angelica Salas, Executive Director of the Coalition for Humane Immigrant Rights Los Angeles, is preparing for immigrant rights marches and rallies on May 1. 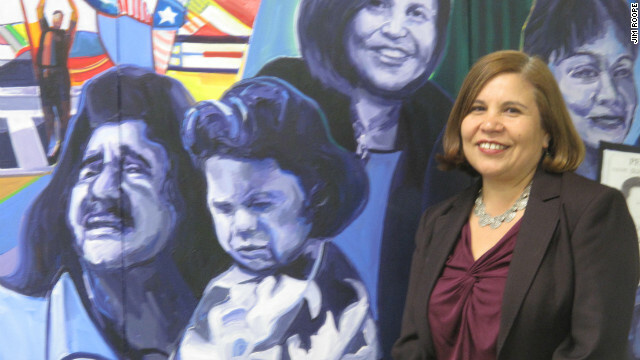 She poses next to her likeness in a mural painted on a wall in the work room of CHIRLA. (CNN) - Two groups just can’t seem to get together on a day of solidarity. For more than a decade, May 1 has been about immigration in Los Angeles. Angelica Salas, Executive Director for CHIRLA, the Coalition for Humane Immigrant Rights in Los Angeles, said for many years the US never celebrated May 1 as International Workers Day. “We felt that Occupy itself had to plan out its particular actions on the day,” said Novick. Salas said ideally, it would have been great to get the Occupy Movement involved with the May 1st Coalition which is made up of various immigration and workers groups because, said Salas, immigrants are part of the 99-percent. “[Immigrants] are part of the base of individuals of Americans who have been brutally, I would say, attacked by corporations,” she said. Occupy LA organizer Novick said that yes May 1 has been traditionally about immigration in Los Angeles, but it’s also for human rights in general. “It’s for labor rights, for economic and social justice, for economic equity, and for peace. And we think that will build a strong force downtown to say this is going to be a day that could change the world a little bit and hopefully for the better,” Novick said. So Immigrant rights marches will be held in the morning on May 1st, and Occupy LA will begin it’s protests about 1 pm. Salas hopes on future May Days the two movements can work together. “May Day is one day,” said Salas. “Our job is to penetrate and work on message 365 days. So I’m not concerned,” she said.